How do you spark a micro-revolution within your company? 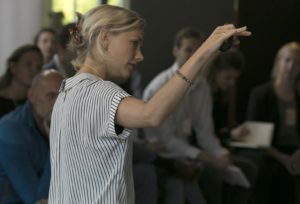 How do you become a social impact intrapreneur? Those are the central questions we ask participants when we kick-off the journey. We invite them them to join forces, come up with solutions around social & sustainable issues, and have a real impact. Freke van Nimwegen, founder of InStock, a company that turns food waste into delicious meals, shares her learnings. 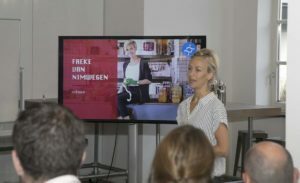 Five years ago Freke, together with three others, launched a circular business within Ahold Delhaize. During her traineeship at the supermarket giant she felt so discouraged by the amount of food she saw being wasted in supermarkets, she started brainstorming with some colleagues. ‘How can we do something about this?’, they questioned, and began to craft plans. Fast forward to 2019: there are now three Instock restaurants in Amsterdam, Utrecht and The Hague, a food truck, a catering department, and an event space. Plus, their founders are frontrunners in the global war against food waste. Freke´s story is an inspiration for the few dozen of people gathering this Friday afternoon on the 23rd floor of the banks headquarters in a room with a 360 degree view over Amsterdam. Her story sparks a ‘can do’– vibe with the crowd. Freke has shown that she and her team were able to conquer the bureaucracy and processes of a large corporate. Her story proofs it ís possible: launch a startup within a corporate. Although Instock is now run independently from Ahold, the group did facilitate the birth of Instock. Then Peter Blokland takes the stage. 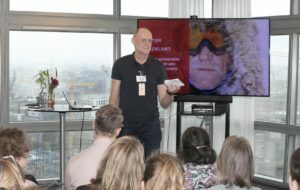 He is a polar adventurer and leadership coach, and here to share his lessons from expeditions on the Arctic with the – mostly millennial aged – crowd. ‘What did you feel when hearing Freke´s story?’, he asks. ‘Did Freke´s story give you a sense of: yes I can?’, he continues. The crowd answers in unison. Then there’s a moment of silence. ‘If you point towards something, you also point towards yourself. Leadership starts with the future. Leadership is trying to deliver the future, through other people’, Blokland continues his speech. Peter Blokland, polar adventurer, physically motivates the crowd. What do you they really care about? A heated discussion follows amongst participants. ‘I would advise my 1 year old daughter: never get a desk job’, one says. ‘I want to provide a better planet for the next generations and decrease inequality´, someone else notes.